The Seed Co Agronomy App on Android and Apple Store. 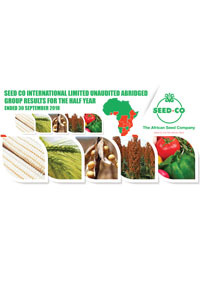 Seed Co develops and markets certified crop seeds, mainly hybrid maize seed, but also wheat, soya bean, barley, sorghum and groundnut seeds. Most of our hybrid and non-hybrid cereals and oil crop seed varieties are proprietary, having been developed and bred at our research stations through market-oriented research and breeding programmes.